133. Saturday December 4th 1875. Still foggy. I practiced a little this forenoon and helped do the work. Soon after dinner, I went to town I did some running around and then went to take a music lesson. I took "Westons march to Chicago" It was nearly dark when I got home. I helped with the work and practiced a little in the evening. Besides writing a letter to Will Reed. 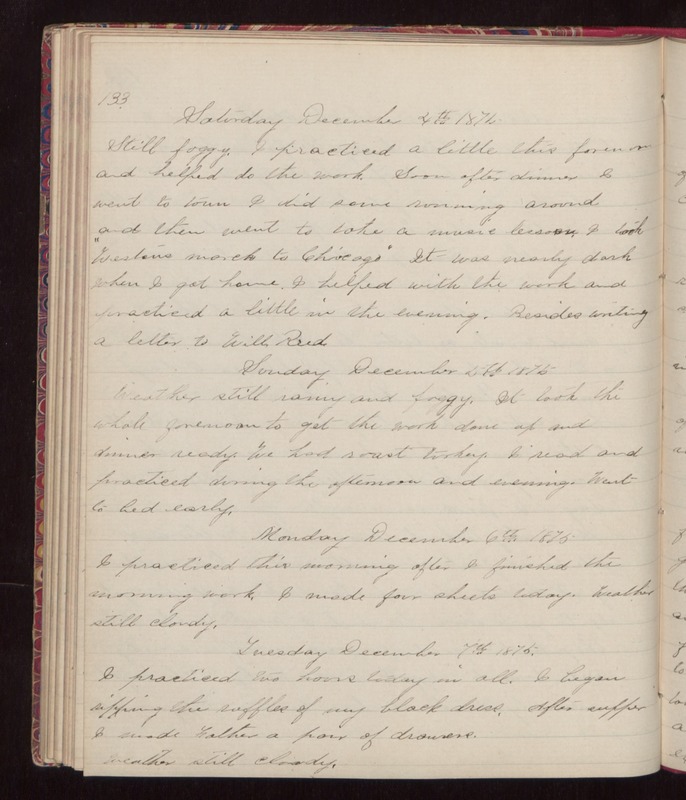 Sunday December 5th 1875 Weather still raining and foggy. It took the whole forenoon to get the work done up and dinner ready. We had roast turkey. I read and practiced during the afternoon and evening. Went to bed early. Monday December 6th 1875. I practiced this morning after I finished the morning work. I made four sheets today. Weather still cloudy. Tuesday December 7th 1875. I practiced two hours today in all. I began ripping the ruffles of my black dress. After supper I made Father a pair of drawers. Weather still cloudy.